One of the benefits of having a newer computer, aside from the fact it works, is the availability of a wireless connection. I can go anywhere in the world now and connect to the Internet and email and everything. I don’t mind telling you, I like that nifty little feature. If the mood struck I could scoot over to Starbucks, order a macchiato, fire up the system, and pretend to work. I won’t, though, audiences intimidate me. But I could send posts from my car if I park in the right place. What I hadn’t anticipated was the window a wireless connection offers into the lives of my heretofore invisible neighbors. I couldn’t pick them out of a line-up, but thanks to my wireless connection I can make some pretty spot-on guesses. Their Internet aliases are definite give-aways and they’re right there on my monitor, listed as wireless networks. That, my friends, is disturbing in a Peeping Tom, I-know-who-you-are-and-I-saw-what-you-did kind of way. It’s none of my business if NETGEAR and mercurymoon are online. Neither is the fact that NETGEAR seems awfully jumpy, one minute he’s on the Internet, then, bang, he’s gone. Oop, no, he’s bac– gone again. The guy should check into yoga or tranquilizers or something. mercurymoon, now she’s pretty mellow. She hangs out for thirty minutes or so, then disappears into the ethernet. Notice how I assigned pronouns to those two? It doesn’t take Kojak to figure out what’s what or who’s who in the world of wireless connections. There’s Juke_Brat and Firewolf and Rowdy, TamTam,too. And somebody called Juliebugs86 — you just know that one has a Hello Kitty shower curtain. Welandedonthemoon is probably an old dude who lives in the past. BigCat is surely the short guy with the giant truck. And ED_NET is likely to be former military, or maybe law enforcement, a no-nonsense, straightforward type. Ten to one he has a single bed and it’s made. I wonder which one is the dope who lives above me, the one who stomps around like Babar in a hurry? Let’s see, he could be Rowdy, but that implies energy or at least intent. I’m going to guess he’s TSL, initials that might stand for ‘the stomping lummox’, that has to be him. If it isn’t it should be. TSL doesn’t spend a lot of time online, he’s otherwise engaged, you know, throwing his shoes into the bathtub and dropping his sofa. Two people, Sue and wireless, appear to be the rational folks in the neighborhood. Unless you count someone called waffletard23, he sounds like a gem. What do you think? A professor? He must have high-speed cable, since he’s always there. He never goes to the bathroom or takes a nap. Perhaps he’s a pod. I’m sure I show up on their monitors, too, but I have no idea how I’m listed. Probably with my full name and apartment number and an open invitation to visit anytime. Day or night. Which would be fine if I lived in Mr. Rogers neighborhood, but I don’t. No, I live next door to waffletard23. Isn’t it? The thing is, I didn’t sign up, so have no idea what name is assigned to my cable connection. Something weird I’m sure. How do you know YOU aren’t waffletart23? Maybe the guy who set up your wireless account set it up like that because he knew you’d never look into it. Okay, now you’re just messing with my head. Being that I am married to an engineer, your description of Ed_Net had me laughing hard. Though you failed to mention engineering as a possible profession for Ed_Net, you nailed it with straightforward. One cannot judge a book by the cover, but one can certainly judge someone by their wireless account name. Juliebugs86 and her Hello Kitty shower curtain bug me already. How could I have missed that? Engineer would have been a great choice! Yeah, juliebugs86, I’ll be dodging her in the laundry room. Thanks for stopping by, LD. It’s a little like checking out what’s in the medicine cabinet isn’t it? I wish I knew what mine was. And, wow, congratulations on your Freshly Pressed post! You deserve it, tms. It’s a robot from Battlestar Galactica who basically wants to Kill All Humans. My friend’s kid was freaking out one day saying “My pajamas are a cylon!” for no reason whatsoever, and I thought it was so funny. Kids are so weird. Anyway, I had to steal it. I would, too, it makes a perfect wireless name. A little threatening, but friendly. Too funny! Great to hear from you and thanks for solving the mystery — I’m a dope when it comes to science fiction. Isn’t she a hoot? 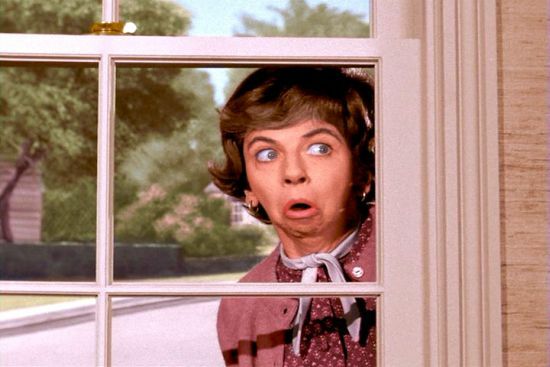 Mrs. Kravitz was my favorite character on Bewitched. It was good to hear from you, breezyk, stop by again. Mrs. Kravitz was the best! (I also loved me some Aunt Clara.) This was one of my favorite posts. Just loved it. And now I’m completely creeped out as I have no idea what a wireless name even is, though I do have wireless. Snizzlebee, netgear, icebox, charlies_network. I just had my husband find out “Who Are the People in Your (My) Neighborhood”. There’s a netgear here, too, must be a provider. It is pretty creepy, but you’ll start checking from now on. I did, anyway.